peek >> << backNew Jersey Ave. at M St., 2005. 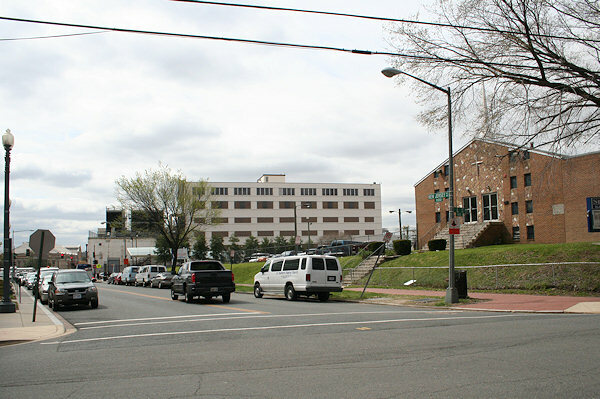 JDLand News Items: 1111 New Jersey Ave.
April 9, 2005 - The western side of New Jersey Avenue, north of M Street, home to the sleepy east entrance of the Navy Yard Metro station, along with a grassy knoll and St. Matthew's Church. 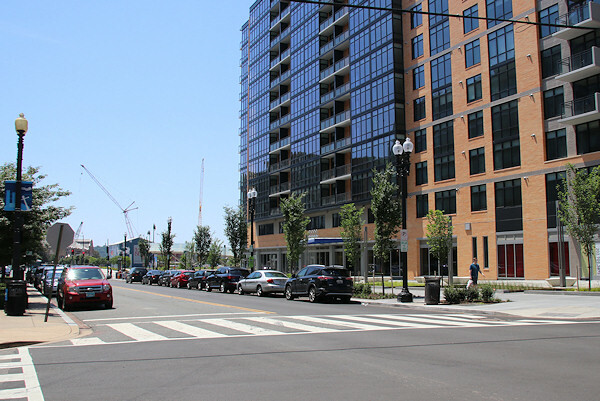 Donohoe purchased much of the land in 2005, then added some small lots that WMATA owned as part of the Navy Yard Metro station east entrance, and finally added the since-razed St. Matthew's Church to the project footprint. March 17, 2019 - The same location, now dominated by Insignia on M, with its festive logo. Jan. 6, 2019 - Chase opened a branch in a retail space near the Metro entrance in late 2018, a few months after Peet's Coffee arrived. April 14, 2018 - The building's first two retails tenant, Bethesda Bagels and Oath Pizza. Looking south from L Street along the west side of New Jersey Avenue, SE, with many changes evident. March 17, 2019 - The building as seen from across M Street. June 1, 2017 - The building's main entrance, and the new wide sidewalk. June 1, 2017 - The lobby. For more interior photos, see this gallery. June 1, 2017 - The rooftop pool. June 1, 2017 - More of the roof. For more photos, see this gallery. June 1, 2017 - The model unit. June 1, 2017 - The model unit's master bedroom. For more photos, see this gallery. June 4, 2017 - A slightly expanded view of same location, in June 2017, with construction at last well visible. Feb. 26, 2017 - The same location, with Ann's Beauty and Wigs now snuggling up to a new neighbor. July 12, 2014 - A last photo of St. Matthew's Baptist Church, not quite two months before its demolition. The hill it stood on is gone as well. December 10, 2007 - The dedication plaque, which hopefully still exists somewhere.